This week DC has been doing it's best to stir the currents around the DC52 with a number of announcements. A new Secret Origins will reveal the backstory of the controversial universe, and much-missed speedster, Wally West is set to return in this April's Flash Annual (see sidebar). Now the tides are changing for Aquaman, who DC lets dive into a second ongoing series in April, starring the most popular new characters the DC52 has produced; The Others. With Aquaman rising to the elite 'two titles at one time' level of heroes, there is but one curve ball, and that's within the book's creative team. 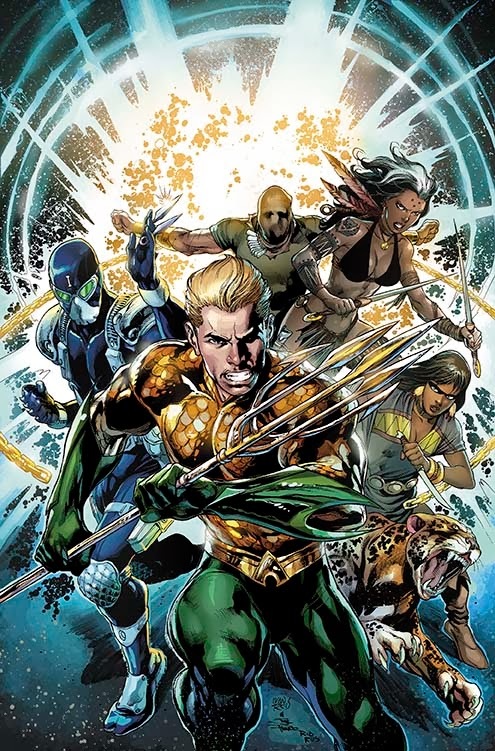 For the last year, iconic Suicide Squad writer John Ostrander has been involved in numerous Aquaman issues starring The Others, expanding and building upon the groundwork laid by Geoff Johns. Its consistency made it seem like the DC was shepherding Ostrander for an Others solo series, yet Dan Jurgens sits in the writer's seat of Aquaman And The Others. That's no disrespect to Jurgens, who as you can read in my interview with Dan himself is someone I equally respect, it's just an unexpected twist that makes you hope the motives do not come from anything health related on Ostrander's part. With Dark Horse losing Star Wars to Marvel, John is a talented pro, one who needs a decent assignment to continue to showcase his spectacular abilities. Dan Jurgens has been the go-to guy of the 52, and it is great seeing him get such a high profile launch. He has helmed Justice League International, Green Arrow and Firestorm, and now gets to return to Aquaman, a character he admittedly enjoyed writing back in the old DCU, more so than Superman, Thor and Tomb Raider, which were also his at the time. If The Others are new to you, those featured above (clockwise from the left of Aquaman) are; The Operative, whose flying fortress allows him to cross the borders of all the intelligence agencies he has connections to; Prisoner-of-War, the man who leads a patrol of ghost soldiers into battle, helping to achieve peace; the telepathic Brazilian warrior Ya'Wara, who shares a bond with the forest in which she lives and the wildcats at her side; and finally Ostrander's creation, the shaman Sky Alchesay, who can converse with the supernatural and the dead, including Kahina The Seer - the original member of The Others, whose spirit, after being killed by Black Manta, chose Sky to replace her. The artistic team for the new Aqua-read will be Lan Medina and Ed Tadeo. I have no idea wtf DC was thinking not using Ostrander, specifically because he was building up and laying the groundwork for future back-stories of the Others. Yeah Jurgans is good and all, but Ostrander would've been a better fit since he aleady knew the material. Thanks Dale. Hopefully Ostrander gets one of DC's big releases now rumoured for June. Still, when Dan's run is done, John should be given first dibs. the Others vs Task Force Elite. This is the fight I want to see in Aquaman and the Others. Hope Jurgan does a good job. I'm on deck for the first 10 to 20 issues (depending). You and me both OA! Aquaman is the best book of the 52 and DC seem set to continue focusing on the King of The Seven Seas in 2014, with this and the upcoming Justice League crossover. Here's hoping Jurgens get's to draw an issue or two as well!